Hey party people. Welcome to July! We’re experiencing quite the heat wave here in Oregon. Think triple digit temps, no AC, and lots of quality time in front of a fan. July is my favorite month of the year for completely selfish reasons. It’s my birth month and I treat every day leading up to the 24th like it’s a countdown to the biggest party of the century (even though I’ll probably just sit at home in my stretchy pants and eat pizza and guzzle wine). Go me (and my fellow July babies)! But before we get into full-on celebration mode (like I can resist), let’s recap June! It was a delicious and productive month indeed. First up, eats! My personal favorites were the Samosa Cakes, Mac n Cheese and Stuffed Peppers. How about you? In June we launched a new website design! We updated our sidebar to include “Helpful How-Tos” and our “Most Popular Recipes.” We also relocated our search bar, made our site more mobile friendly, re-designed and better categorized our Recipe Page (yay! ), and updated our About Page. Look around, enjoy the new digs, and let us know if there’s any other way we can improve your experience on Minimalist Baker. We’d love to know! Bloggers (and wannabe bloggers) can find our top blogging tips and all the technical tools we use on Minimalist Baker at Blogger Resources. I had the pleasure of being interviewed by Jessica Murnane of the One Part Plant Podcast in June. We talk cookbook, diet, blogging tips and more. Check it out! And while you’re at it, snoop around her site because she has some awesome plant-based recipes and resources. A new-to-me blog that I’m loving this month is Well and Full. If you’re into delicious plant-based recipes, gorgeous photos, and thoughtful narrative, this is one to check out! My fitness of choice lately has been running! Hip pain sidelined me for the better part of winter and spring, but I’m so happy to be out running again, slowly but surely. In case you’re interested, a few of my favorite running must-haves are these shoes (in black), this smart phone arm band, and the Nike+ running app! 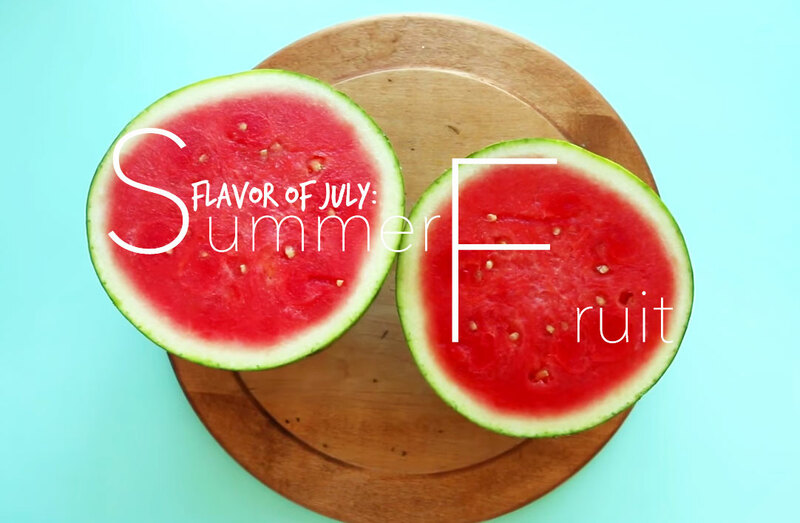 How can I resist all of this gorgeous summer fruit in July? Expect berry and melon recipes galore. That’s it for now! See you all back tomorrow for a new recipe. Happy birthday, Dana and happy July! I’m also a July baby and so is my husband and we’re planning our first trip up to Portland to EAT!!!! So looking forward to all your vegan restaurants and stores! Yes, we do have lots of vegan restaurants here in L.A. but Portland seems so cool! Happy July!! I’ll be thinking of you on the 24th! Can you be on the podcast every month?? Loved our talk so much. I made the pad thai spring rolls. It was a bit of prep work, but OH MAN.. I am a convert.. I am making these twice a month at least! The tofu gets the most delicious flavor, and they were really fun to assemble once the prep was done. My hubs and I dug in to the sauce and savored every bite! It made enough for dinner one night and lunch the next. GREAT recipe! Thank you very much! So great! Thanks for sharing Robyn! Glad you liked them! Of course! You’re on my Feedly now – can’t wait to see what you come up with, girl! Not gonna lie, I’m not too jealous that I’m missing out on that heat wave lol and I’m loving the new website design! It’s gorgeous! Yum food pics! The papaya boats look so delish- I need to check that recipe out! You have such a fun blog, thanks for sharing all of this! And I totally feel you on the heat wave situation. I live in SoCal now, but I grew up in Texas, and every summer was like a sauna- but not the kind you entered willingly. All the more reason to eat papaya boats and drink white wine! I just found Well and Full yesterday! It’s a gorgeous site with a thousand recipes I want to try! So great. 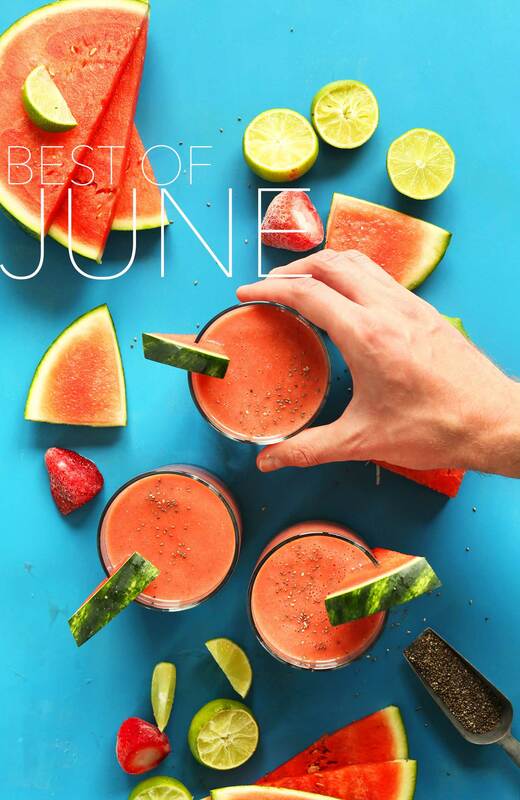 Your June food looks amazing. The Samosa Cakes are my favorite. It’s main ingredients are potatoes and innovation. Great roundup! Glad you found her too! AND that you liked the Samosa cakes – my fave, too! Have a great summer, friend! All of these look great! I love the ice cream recipes! Thanks so much for sharing this great roundup! That smoothie looks delicious, and I definitely need to try out the fruit crisp. Happy July! Yes you do! Let me know if you give it a try, Elizabeth!